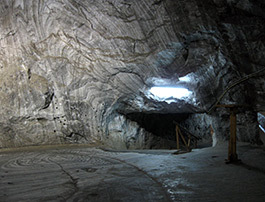 Situated at 10 km away from Sovata resort in the Harghita District, Praid Saline is one of the biggest salt mines from the country and even Europe. Its exploitation has been standing for income source for the inhabitants of the area for hundreds of years. Having an elliptical shape, the deposit has the diameter of 1, 2-1, 4 km and the depth of 2.700 meters. 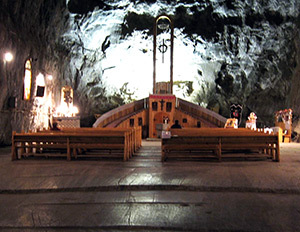 Its deposits are almost 500 years old, the saline itself represents a true treasure for the economy of Transylvania. Subterranean holes of great dimensions can be spotted, because of the massive salt exploitations. This way, a saline microclimate has slowly individualized itself, where the temperatures are relatively constant, between 14-16 degrees Celsius, the humidity is low (66-70%) and the pressure is stronger than the pressure of the surface (735-738 mm Hg). The access into the saline is made by coming down 300 abrupt stairs. 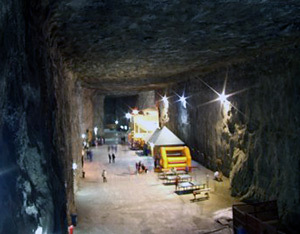 120 m below the surface, there you can find a real underground city. You can arrive in the heart of the mountains by bus through a long tunnel (1500 m), and then the access into the saline is made by coming down 300 abrupt stairs. 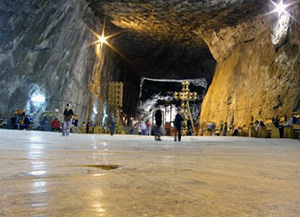 120 m below the surface, there you can find a real underground city. The air is powerfully ionized and its extremely efficient what the breathing problems are concerned. The treatments are given under the supervision of a medical team that organizes gym programs and breathing exercises for every disease, as well. Practically, the treatment consists of saline air inhalation, good results being achieved only after 18 days, if one spends 4 hours per day in the saline. 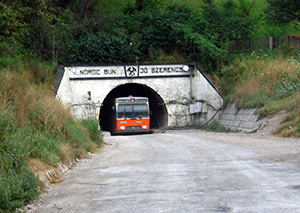 The first level which is dedicated to the tourists is 1300 m long. Tourists have everything they need in here: treatment places, coffee shops, billiards, libraries, entertaining places and even a place where people can pray. The chapel from the saline was built in 1993. Since then, on every Wednesday, Thursday and Friday, religious ceremonies have been holding for Orthodox believers, Catholics and Protestants. There is also a museum, a library and even a wine gallery, where different kinds of drinks can be degusted. The temperature is 16 degrees Celsius every time of the year. During the summer season, the number of people that want to be treated in here can reach 2500-3000 per day. What the entertaining conditions are concerned for those that arrive in this locality in order to be cured, it can be mentioned that various actions are performed in the show hall, library, on the sports ground. The ones that are the adventurous kind can travel around the picturesque places surrounding this locality. There is a swimming place with salted water in Praid and hot salted baths are organized in water tubs which are placed near the swimming place. The water is warmed in big boilers and it is very efficient in the rheumatism treatment. The salted and iodated water has a calming, physically and mentally relaxing effect. The salted baths is really effective on the human organism. Their effects are calming, physically and mentally relaxing, anti inflammatory, vaso-dilator, skin and mucous membrane sterilizing, cicatrizing. The duration of the baths ranges from 10 minutes per day to 30 minutes. The temperature of the salted water is 36 degrees Celsius. A treatment in the water tub consists of 10-14 non-stop warm baths. The salted baths are at visitors’ disposal from the 1st June till the 15th September. The chapel from the saline was built in 1993. 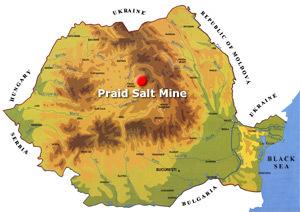 Praid Commune doesn’t have high tourism ratings. The most visitors chose to check in at Sovata resort and walk daily for several km till the salt saline. Only recently have the private pensions been offered as accommodation solution and their prices are affordable: 100-120 lei for one room. 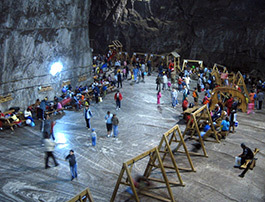 Outside the salt mine, the only attraction nearby is the salted water basin, which is situated 200 km away from the saline entrance. 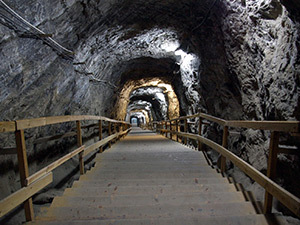 Entering the salt mine – You can arrive in the heart of the mountains by bus through a long tunnel (1500 m), and then the access into the saline is made by coming down 300 abrupt stairs. The visit lasts only one hour. 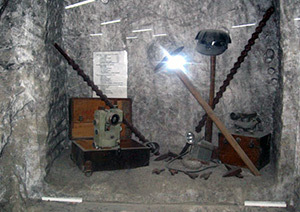 Tools used in the exploitation of the salt mine. There have to be no less than 25 people into each bus, for the trips to the saline to be made (8:00 AM – 12.45 PM). 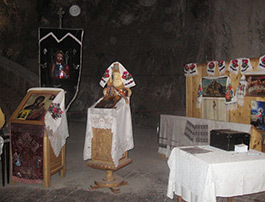 The chapel from the Praid salt mine. Salt from Praid salt mine. 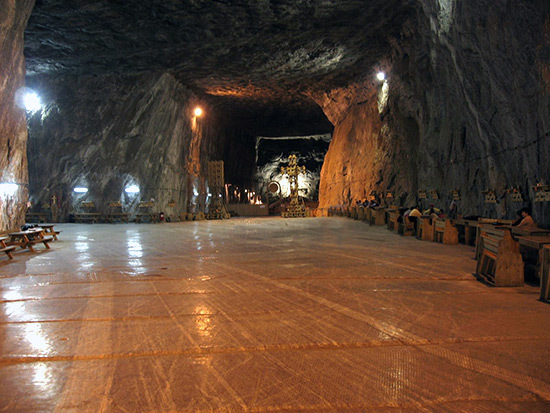 Praid salt mine, before descending the 300 steps. Tourists have everything they need in here: treatment places, coffee shops, billiards, libraries, entertaining places. 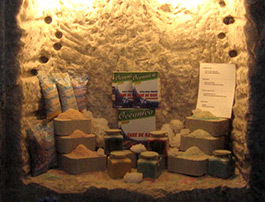 I am interested in buying rock salt in grey colour. Is it possible? What is the price? How is the granulation. I look forward to hearng from you.